Phew, that was a workout! I have finally completed calculating all the entries and extra entries a winner has been selected randomly. Congratulations!!! 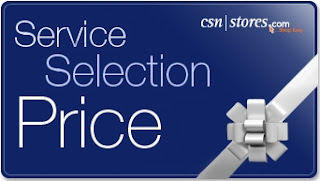 Thanks to all of you who entered and to CSN for such a generous giveaway! Yippy! I was so excited when I saw this when I woke up! What a great way to start my day! I should go buy a loto ticket now...feeling lucky!! Congratulations, Cortney Lion. Enjoy spending your prize.